A couple from Basingstoke had a shock this morning when they rounded a corner on the A339 and were confronted by an overturned lorry. Shani Rogers and her husband Bob, of Western Way, South Ham, were on the road in the Bentworth area at around 10am this morning when they saw the overturned lorry still smoking. Shani, 51, said: “It must have just happened when we got there. We went around Brighton Hill roundabout twice on our way there this morning when we were deciding where we wanted to go. “It’s so frightening to think what could have happened if we hadn’t and had been on that road as the lorry went over. 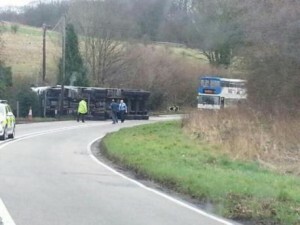 The haulage lorry had been traveling in the direction of Basingstoke when it overturned. Hopefully for the drivers sake he’s got a good lorry insurance policy, to cover the damage done to his vehicle. The driver of the lorry, which was transporting grain, was taken to Basingstoke hospital with an injury to his arm after being freed from the cab by the fire service. The road was closed in both directions for more than three hours for grain and diesel to be cleared.